Bayern Munich remain on course for a famous treble after clinching the Bundesliga title in record time after beating Eintracht Frankfurt 1-0 on Saturday. 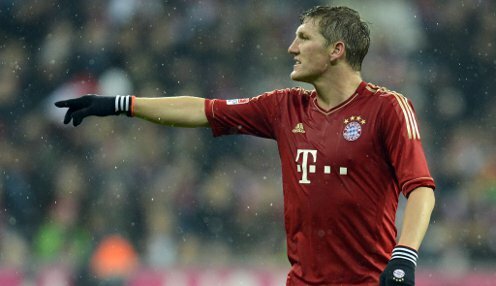 Bayern secured their 23rd title with six games to spare after Bastian Schweinsteiger scored the only goal of the game with a sublime back-heel. One of the things FC Bayern have demonstrated this season is that we're a top side, but we have done it with harmony in the team. Jupp Heynckes' side can now concentrate their efforts on winning the Champions League and the domestic cup. Bayern have lost only once all season, conceding 13 goals, and have won all 11 games since the winter break to open up a 20-point lead over second-placed Borussia Dortmund, who are 1/1 to win the Champions League, while Bayern can be backed at 1/1. Heynckes said after his team's win against Frankfurt: "The fact that we have won the title after 28 games is extraordinary, it's simply fantastic. "One of the things FC Bayern have demonstrated this season is that we're a top side, but we have done it with harmony in the team." Bayern lead Juventus 2-0 after the first leg of their Champions League quarter-final and face Wolfsburg in the semi-finals of the German Cup.